RE/COVER Green is made of high-grade ecological elastomers and 90% regenerative raw materials like castor and rapeseed oil. With there being a growing demand of acting in an ecological and sustainable manner within the Architecture and Interior Design industries, Vorwerk Carpets has launched a new Organic Elastic Flooring named ‘RE/COVER Green’. RE/COVER Green is made of high-grade ecological elastomers and 90% regenerative raw materials. One basic component is castor and rapeseed oil from the seeds of the tropical castor oil tree. The Organic Polyols extracted from castor and rapeseed oil replaces the PVCs which are used for conventional flooring design. German ecological products and technologies are innovative, reliable and assume a pioneering role on an International scale. The organic flooring is extremely durable and resistant to wear and tear. This makes for an excellent choice for heavy-duty workload areas such as offices, retailing, healthcare, hotels or public-access buildings. 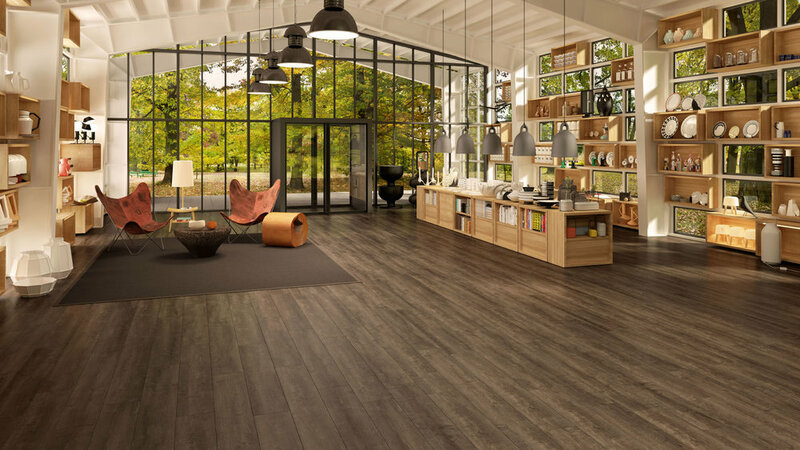 There are 60 unique styles and designs, providing a wide variety of ecological and unique floor options to fulfil high aesthetic standards. Plain Hued Styles: The Plain Hued styles are Monochrome, giving a discreet sparkling effect. This is inspired by a water surface in motion and a lively appearance as it slightly reflects the surroundings. Printed Styles: Interpretations of woods, stone and metal. Parts: Available in three different sizes and allows various plank formats to be combined. The textures interpret materials from nature and the environment in different degrees of abstraction. RE/COVER Green fulfils all ecological specifications and a combination of seals for quality approval.